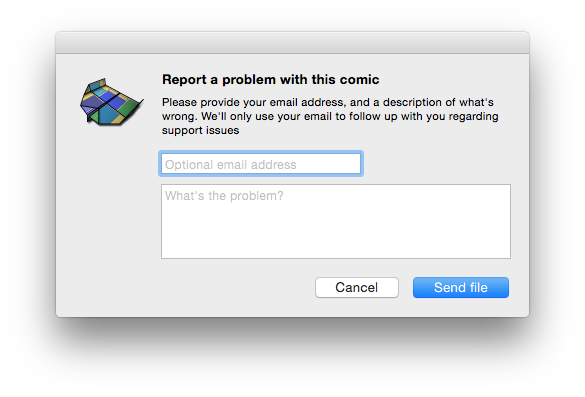 If you ever experience a problem with a comic in your library, there are a few ways you can notify Abbey Code, so we can fix whatever's wrong. From this window, you can, if you choose, provide your email address. This will allow us to contact you with any follow-up questions to help us fix the problem. Then, you can (also optionally) provide a description of what's wrong. You can provide as much or as little detail as you'd like. Providing more detail will help us to fix your problem more quickly. Once you click Send file, it will upload to us, so we can investigate. All information is kept confidential, and used only to help support you, and fix anything that keeps you from fully enjoying Comickaze, which is our goal.